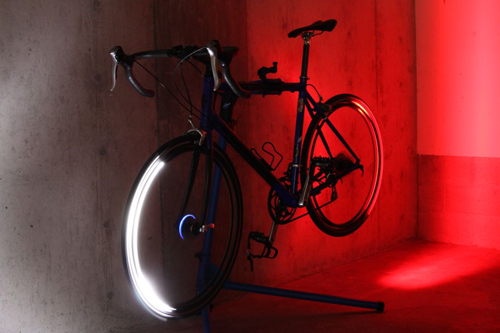 As seen on ABC’s Shark Tank, here we offer one of the first reviews of wheel illuminating Revolights bike lights. 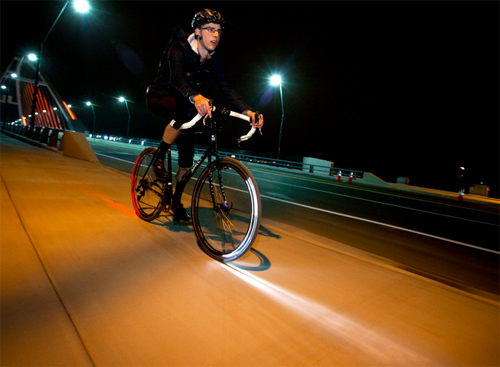 Urban bike light’s design get cyclists noticed at night. If a lighting system more “noticeable” than Revolights exists, I haven’t seen it. And judging by the overwhelming response I received with the wheel-mounted lights the past two weeks, neither has anyone else. Since then I’ve put in about 100 miles of night riding with the spinning LEDs, slicing through the darkness and lighting my way. Reactions range from pedestrian comments and inquiries, like the aforementioned, to a city bus matching my pace for several blocks so passengers could take pictures of the lights with their smartphones. No, seriously. Without the lights, my bike’s not flashy enough to draw attention, and I’m not nearly good looking enough for it to be for any other reason. While $200 is steep for commuting lights, the Revos are something new and totally different. You can’t be missed riding at night with these blazers mounted on spinning wheels. Safety is their No. 1 theme, though the bling and pure coolness factor definitely isn’t lost on anyone either. The concept for the design was born out of a practical dilemma. Fresh out of a mechanical engineering master’s program at Stanford, Kent Frankovich was frustrated by the helmet-mounted light that he commuted with at night. Frankovich prototyped a wheel light shortly afterward before joining entrepreneurial forces with business student Adam Pettler in October of 2010. The San Francisco-based duo designed and produced several iterations of the lighting system before turning to the power of online crowdfunding to kickstart the operation last fall.